What I wouldn't give to see this..
Oh, wow, I haven't heard about this at all. Seems to be some sort of fan documentary or something. Anyone know more? Afraid not. A friend posted this to facebook and as soon as I picked my jaw back up off the floor, I posted it here. Surely it's a small convention, not a video project? Interesting that they have an event but no guests to announce at this stage. I'm a tad suspicious of a fancy website announcing something and then ... zip. Read the latest post on Avengers Declassified, so guests are announced now ! Is there a specific date in October ? Coz my school break will begin around the 20th I think...And I'd love to attend to this event ! I've been blessed by The Avengers! Sunday October 10th, Joris, so probably a bit early for you, frustratingly. I think you may have misread my announcement at The Avengers Declassified - they've announced the event, but no guests are confirmed or announced yet. I have to say, I'm in agreement with Dandy on this one, they are certainly not getting my money until they announce a guest or two! Fantom Films themselves are legit though, and their events are reputedly worth attending, not that I've been to one yet. do you think, it's a put on ? I couldn't possibly comment. I think it's a handsome website, but at the moment it's offering nothing. We will have to see! Neither the partwork or the event are "put ons", as they are from reputable companies with past products/events that would give you reason to trust that they are genuine. The partwork was only ever meant as a regional test. I understand they will go national with a full release later this year. The event will, I'm sure, happen - but I'll need to see some evidence of guests worth seeing before parting with my money! I should explain I don't think either projects are doing anything underhand, it's just a bit cart-before-the-horse to announce something on the 'net and then nothing. It does create cynicism when the trail goes cold. Just wanted to introduce myself - I'm Dexter - and I'll be running the Avengers event on 10th October. My company - Fantom Films - organise regular Doctor Who events in Chiswick and we are expanding using the same successful format to celebrate The Avengers. There will be approximately 10 guests in attendance from both sides of the camera who will take part in stage panels and answer questions from the audience - followed by an oportunity to get their autographs. Tickets are £35, which includes access to panels, a sounvenir programme and two autographs per guest. Extra autographs are £5 each and photos/merchandise will also be available for sale. The first guest is now announced and others will follow in the forthcoming weeks. I can assure you there was nothing underhand - we want to get ahead and announce are intensions for an avengers event to start spreading the word! Any questions or guest suggestions are welcome - and if you'll allow me, I'll pop back and give you news as and when I have it! Thank you for coming here to give us the scoop on the Avengers event for October 10th! It sounds exciting and fun. So there you go guys..start saving those pennies and get your tickets. And Dexter, any news you care to share with us is always welcome. Very interesting first guest, too. Murray Melvin. A fascinating career encompassing The Avengers, Diary of a Nobody, Jonathan Creek, Torchwood (in which he was one of the few saving graces) and collaborations with the likes of Ken Russell and Stanley Kubrick. For me Murray Melvin will always be Geoffrey in A Taste of Honey. A brave role to play in the early 60s. "The dream has gone, but the baby is real". Peter J. Elliot now announced too. Stuntman and (I always find this funny) Diana Rigg's stunt double. 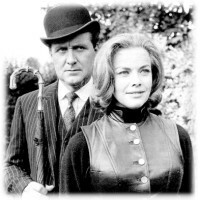 I only remember Billy Westley being mentioned as Diana Rigg male stunt double. I didn't know there had been others. It's so nice that they gave other people a turn in the leather--Billy couldn't hog it all for himself.